Mark Rothko, 1903-1970: A Retrospective, Solomon R. Guggenheim Museum, New York, 1978, no. 25, repro. (shown only in New York). 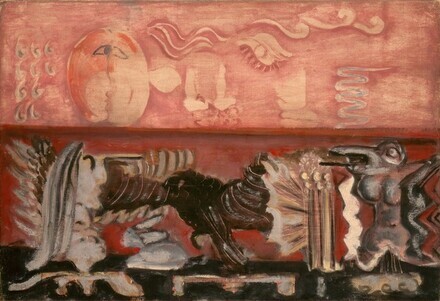 Mark Rothko, Palazzo delle Esposizioni, Rome; Kunsthalle der Hypo-Kulturstiftung, Munich; Hamburger Kunsthalle, 2007-2008, no. 31 (English cat. ), no. 19 (German cat. ), repro. American Paintings: An Illustrated Catalogue. National Gallery of Art, Washington, 1992: 294, repro. Anfam, David. Mark Rothko: The Works on Canvas: Catalogue Raisonné. New Haven and London, 1998: no. 198, repro.